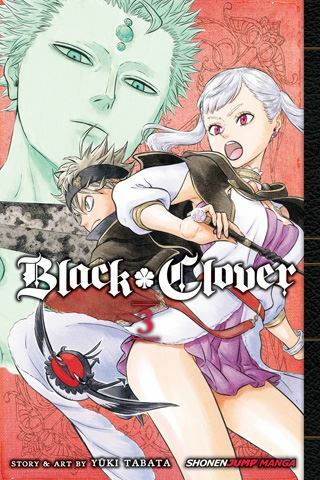 Written by: Yuki Tabata, Satsuki Tamashita and Taylor Engel, HC Language Solutions, Inc.
VIZ Media Launches "Black Clover"
In the village of Hage, there was a young boy named Asta, who, along with his friend, Yuno, was once found abandoned. Asta dreamed of one day being the “Wizard King,” the greatest mage in the land. He has one big problem; he can't use magic. When he was 15-years-old, Asta received the rare “five-leaf-clover grimoire” (a book of magic), which gave him the power of anti-magic. Can Asta become the Wizard King without being able to use magic? He won't give up, nor will his talented friend, Yuno. As Black Clover, Vol. 3 (Chapters 17 to 25; entitled Assembly at the Royal Capital) opens, the Golden Dawn and the Black Bulls (the Magic Knights team to which Asta belongs) finishes their fight with the invading mages of the Diamond Kingdom. During the battle, Asta shows just how formidable he is, but can he truly take on the most powerful invading mage, Mars? THE LOWDOWN: I enjoy this manga about an orphaned boy with magical powers. The hero of the Black Clover manga reminds me of another youngster who must also undertake the hero's journey, Harry Potter. Black Clover Volume 3 offers some impressive displays of magical power unleashed in service of fighting. I don't know if Black Clover will become a special battle manga, but creator Yuki Tabata offers much in the way of imagination and inventiveness. Bolts of battle magic aside, the world of Black Clover offers much to attract readers. POSSIBLE AUDIENCE: Fans of everything from Naruto to Harry Potter will definitely want to open up the spell book that is Black Clover.